Wide Applicable Ranges: The wireless numeric keypad can used in occasions including financial office, banks, business office, etc. Ultra-thin & Durable: The ultra-thin 18 Keys Wireless USB Numeric Keypad is made with good quality material for comfortable and quiet use. Easy to Use: Simply plug the USB receiver into an available USB port of your computer and it's ready to use, no driver needed. LED Indicator Prompt: The blue LED indicator on top left corner indicates whether it's ready for data entry or not. Comfy Typing Process: 18 full-size and concave keys including backspace key enables comfortable numbers typing experience without having to 'hunt-and-peck' on your laptop keyboard. Noiseless & Comfortable: The design of ultra-low key makes you have a very comfortable touch feeling. Moreover, the mute effect and the overall layout of simple compact key bring you comfortable operation. Compact and Convenient Wireless Keyboard, Great Accessory for Small Laptops Without A Separate Keypad. 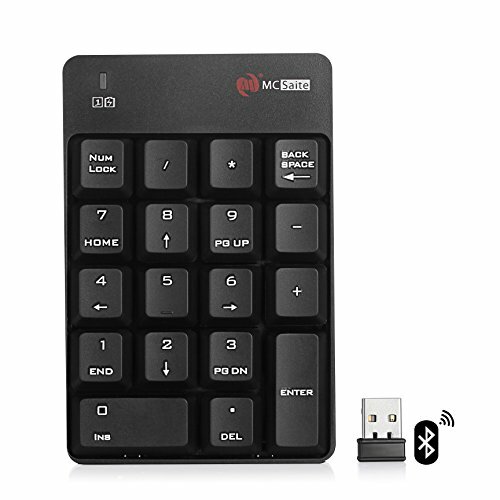 18 Keys Wireless Numeric Keypad Supports NumLock Backspace, Large, Full-size, Soft Concave Buttons for Increased Efficiency. 2.4 GHz Wireless Micro Receiver, Plug and Play, USB Wireless Connection, Signal Transmission Stability, Up to 10M Working Range. Rubber Non-slip Pads Design at the Bottom, More Secure Stable, Size 124*82*18mm, Easy to Carry and Use. If you have any questions about this product by LCStream, contact us by completing and submitting the form below. If you are looking for a specif part number, please include it with your message.